In the 1940s and 1950s, it was tough to find a Black doll — let alone a multiracial doll — that reflected the true beauty of Black kids and women. And finding the very best, most realistic Black dolls out there? Fat chance. In fact, studies conducted by Mamie Phipps Clark and Kenneth Clark during that time period revealed that both Black and white children favored white dolls over Black dolls and even viewed white dolls as more beautiful. Recognizing that something needed to be done, a woman named Sara Lee decided to create Black baby dolls that truly represented Black girls. These dolls were in stark contrast with other dolls of the time — witch were either stereotypical representations or simply darker versions of white dolls. Lee even called on anthropologist and writer Zora Neale Hurston (yes, the acclaimed author of Their Eyes Were Watching God and Barracoon) to ensure she got it right. Hurston’s input led to the creation of the Sara Lee doll, one of the first realistic-looking Black dolls in the U.S. After they settled on a design, they still needed to determine the skin color for the doll. So Hurston and several other Black leaders (including sociologist Charles Johnson and baseball player Jackie Robinson) decided it would be best to market four different dolls — siblings — with varying facial features, hair and skin tones to display the diversity within the Black community. 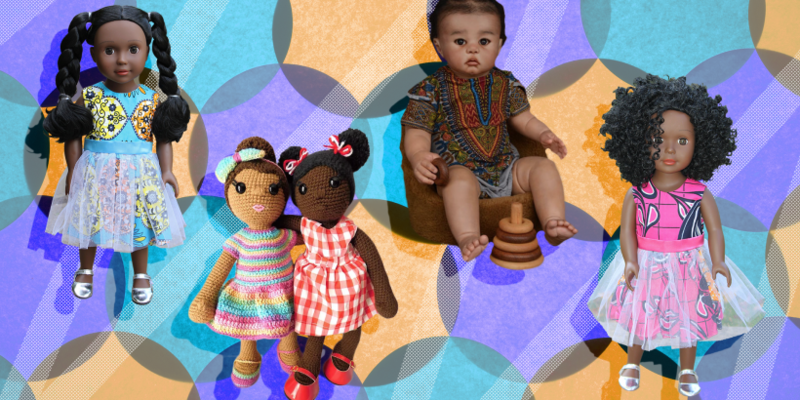 Today, 70 years later, the diversity of dolls available to kids of color has expanded to include dolls that are Black, Brown, multiracial, and more. However, there’s still more to be done. For example, in 2017, Krystal Kay decided to create custom dolls for Black girls and women because most of the dolls she saw in stores didn’t reflect the full body types and natural hair textures of Black and multiracial girls and women. “Black women are shapely; we’re curvy,” Kay tells SheKnows. “The overall reflection of us from top to bottom, our noses, our lips… Look at some of the historic Black dolls — they’re a mockery that over-exaggerates. We were mocked for years.” Kay’s dolls, on the other hand, reflect the expansive diversity of Black and biracial women — including dolls with albinism, vitiligo and disabilities. Her goal is to represent a new generation of doll makers who are committed to intersectionality: diversity within diversity. Ahead, you’ll find Krystal’s dolls as well as those of 10 other doll makers that prove Black is beautiful — and that it comes in many forms. Which is more striking — the hair, skin, eyes or painted toe nails? This beauty is a Kay Customz original. When Ozi Okaro had difficulty finding dolls that mirrored her two daughters’ different skin tones, she created Ikuzi Dolls. The brand’s goal, she says, is to represent the “different shades of Black beauty” that girls of color can identity with. The brand even sells a line of mermaid dolls. The U.K.-based Lola Love Dolls provides a diverse collection of Black dolls, including dolls in jihab and this beauty. It’s hard to believe this doll isn’t a real baby. That’s because Baby Lola underwent the “reborning” process, where she was transformed from a vinyl doll into a lifelike one. She retails for a pretty penny ($2,500) from Sheva Dolls, a company that specializes in Black and biracial dolls. Your little ones can play with their Cute Little Crumbsnatchers Handmades dolls in the rain, snow and sand. The dolls are made with acrylic and cotton yarns, stuffed with hypoallergenic Poly-Fil, armed with safety eyes and built to endure your child’s outdoor adventures and the washing machine and dryer. Herstory Dolls mix play and creative storytelling. Each doll comes with a notepad and writing utensil for kids to create an original story about them. TammyBCreations produces one-of-a-kind, 100 percent handmade crochet dolls. These original dolls sport an assortment of hairstyles, from cornrows and Afro puffs to curly coils. Mom Melissa Orijin started Orijin Bees after she noticed that her daughter’s preferences in dolls changed after she started attending school. Orijin created this line to help her daughter appreciate the beauty of her ethnic heritage. Dolls are eco-friendly and nontoxic. Fancy Fancy Crochet designs custom dolls with 15 skin tones. Tennis star Serena Williams served as the inspiration for this doll. Mixed Chicks’ line of multiracial dolls is here to remind everyone that mixed girls rock. Each of the four dolls comes dressed in pants, a jacket and a T-shirt with its signature message. Buy one, two or all four — they’re only $10! For Black History Month or really any month.